I’m jumping in at the stage where we’ve already got the terrain, major locations and roads mapped out. The next step is filling all the remaining space with buildings to turn a skeleton of a town into a town. The key here is to give the impression of a large number of buildings, without having to agonise over every single chimney pot and awning. Here I’m using the pen tool in Photoshop (P) – you can also use the pen tool in Gimp (B). Under Paths, hit the New Path button, and give it a name. Here I’ve called it “Houses”. The advantage of using the path tool is that you can go back and edit any element of the city at any point. This is invaluable. It may be that you need to add a road later once and have to move some buildings to accommodate. This way, just use the direct selection tool (A) in Photoshop, or the pen tool (B) in Gimp and go back to edit the vector outline of the houses. Many path tutorials will focus on the fact that you can use the path tool to create bezier curves. We’re not doing curves today, but creating straight sided polygons instead. To lay a house polygon, click one for each corner. Because you’re clicking – rather than clicking and dragging – the path lays in straight lines between anchor points. 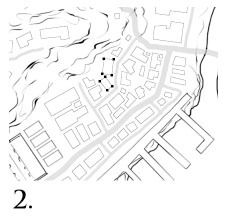 Click again on the first point (you should see a small circle appear under the pen cursor) and the path will close. In Gimp – you need to command-click the first point to close the path. Click again somewhere else to start the next building, and you’re off! First of all, don’t worry about the shapes being precisely right. 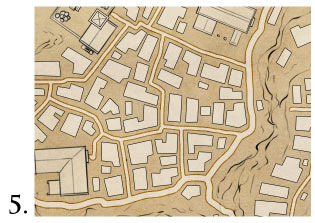 Any town map will have a lot of buildings, and the chance of a viewer looking at any one and judging the historical accuracy of the building shape are slim. You want the impression of an urban sprawl without having to carefully design each bit of sprawl. So, work quickly, and don’t sweat the details. But – make some decisions about the blocks that you’re filling in. A slum area should have smaller and more disorganised buildings – or solid tenement blocks. There shouldn’t be too much spare space. A wealthier neighbourhood might have bigger building with more empty space around them. Use a variety of building shapes. It may well be that buildings are mostly rectangular, but a complete uniformity of buildings forms a repetitive pattern – and out brains are very good at spotting repetitive patterns. That’s part of the reason we’re doing these shapes by hand. Add variety – t-shaped buildings, l-shaped buildings. It might start to look a little like the reject bin in the Tetris factory, but that’s okay. Remember, we’ll be seeing this zoomed out, not examining every single building in turn. Also, use negative space. We see not just the buildings, but also the space around them. Leave courtyards and meeting areas, squares and plazas. Leave more empty space in some parts of town than others – even if you don’t have a reason why. Either you’ll come up with a reason later, or your players will rationalise the difference for you, and add detail to your world without you trying. The roads and terrain have a flow to them – let the buildings work with that. Fill in the empty space around your featured locations, but use the buildings to describe lines and emphasise the larger shapes of the town. So, for example, a line of similar size buildings all curving around a bend will suggest that the buildings are all the same, and might help to sell a barracks, or pre-built line of miner’s cottages. In contrast, a set of widely varied buildings, all spaced out, might be the mansions of the wealthy – all created to each person’s taste. Filling in the buildings takes time – lots of time – but the end result is worth it. I’ve got a few methods of laying out blocks that are more automated, and these help for cities, but nothing beats just drawing in all the houses. Once you’ve tweaked your houses to your liking, turn the path into a selection. (Path’s palette – button at the bottom ‘Load Path as Selection’ -PS, or Path Tool -> Tool Options -> Selection from Path, Gimp). Create a new layer, and fill the houses selection with a colour of your choice to lay in all the houses! Here I’ve used some layer options. I filled the selection with white, and set the fill opacity to 50%. I also added an inner stroke of 1px in black. There are lots of good choices for layer styles that can give you a more satisfying set of houses from this selection, but that’s a tutorial for another day. For now, you’ve got a full layout of your town. If you want to create roads like the one in this image, here’s the tutorial for this road style. That’s it for now. I’ll post some alternative house style tips over the coming week, and delve into what to do once you’ve got all your vector outlines, later in the week. Check out more tutorials in the tutorials section. Good stuff. The alternative instructions for GIMP are handy. Thank you for making these tutorials! I love them. Only thing I’m not clear on (for GIMP, that is): how did you add an “inner stroke” to the selection? You can do it by creating a new layer, stroking the selection (Edit -> Stroke), then inverting the selection and deleting. It’s a little bit of a long way round, but it gets you there. I know this is an old page, but I was wondering if you have a tutorial on how you did the important buildings for this map? I’m having trouble getting stuff to look like I want it to, and yours look really nice. If not, if you maybe can point me to something that would help me? Awesome tutotial, thank you so much. I was looking for the next tutorial in the series regarding how to transform the white rectangles into nice-looking houses but I couldn’t find it. Was this not done after all? No, that was never completed. That’s a good reminder I should get onto that. any progress on the next video?